Typically dictators do their best to reinforce their legacy while they’re in power and once they’re deposed everyone else tries to forget them. Even looking back at last year (a bad one to be a dictator indeed), statues are demolished and metro stations renamed while governments changed. The manic rule of Nicolae Ceaușescu is one many Romanians would like to forget, and even 23 years now after his execution, the topic of the Communist era seems touchier here than other former bloc nations. Symbols are easier to erase than memories which is why they’re usually the quickest to go following a revolution – except when they happen to take up 2.55 million cubic meters. That’s the approximate size of the Palace of the Parliament building (Palatul Parlamentului) in Bucharest. The Palace of the Parliament Building is the heaviest administrative building in the world with excesses tipping the scales. 3,500,000 kilos of its weight alone is in crystal (less than 1/10th of 1% the palace’s total), found in over 475 chandeliers throughout a building originally built to house Ceaușescu’s political and administrative power absolute. 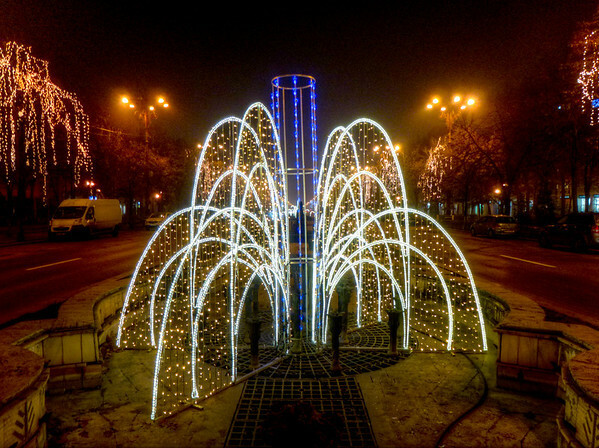 It’s extravagance even extends out to the massive boulevard leading up to the Palace of the Parliament; the space made by demolishing most of Bucharest’s historic district. Ironically the building was short of completion right after the 1989 revolution but already too massive to be practically removed. Rather, it’s been re-purposed to house the offices of the presidency, parliament, and other government officials in over 1,100 rooms. 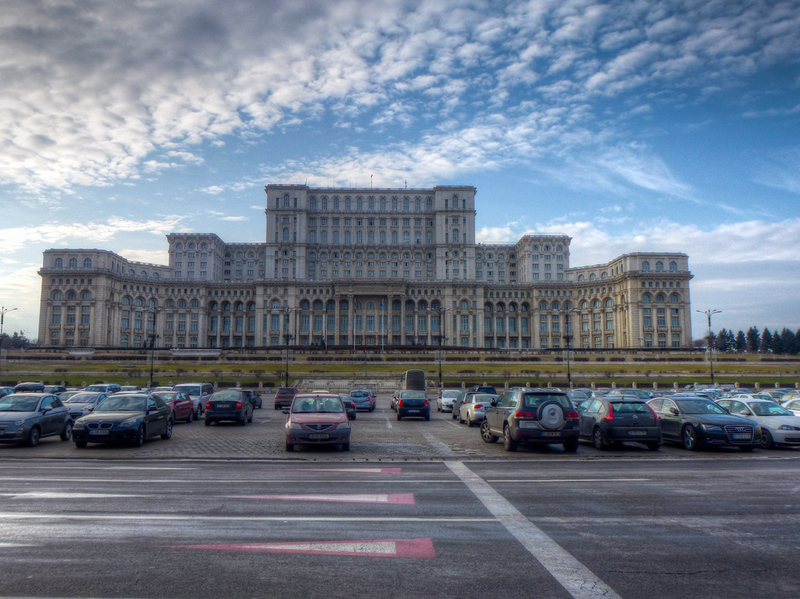 You’ll frequently hear in Bucharest that this is the second biggest building in the world; and when looking at it, that’s hardly unbelievable. Except that it’s not the second largest building, rather the second largest government building in the world, second only to the Pentagon in the United States. A gigantic as this building is (carpets had to be helicoptered in from the roof during construction), in terms of floor area the Palace of the Parliament is only the 60th biggest in the world. As for the largest, well, that title (in terms of floorspace) currently goes to the Abraj Al Bait Towers in Saudi Arabia. Interesting trivia about the Pentagon! It sure looks like it would be hard to ‘erase’ – glad they at least are using it. I was surprised to learn that too in Bucharest but even still in person the Palace of the Parliament looks much bigger! Wow, that’s a beautiful shot — had no idea their Parliament looked like that. Thank you. I wish I could have gotten an aerial shot to show you the shape in context from above. Simply massive. At least this building beats the rest of the biggest buildings with its weight. The picture alone already had me in awe. It displays so much power and I get now why they built it that way. It is an impressive feat of architecture and took years of work (literally) around the clock to complete the palace. Unfortunately much of the extravagance spent on it and contributing to its weight was at the expense of the people in the country. Many in Bucharest deeply hate it. As you mentioned, the best part of the city was demolished to make room for this building and the psycho boulevard that leads to it. It cost an enormous amount of money and probably sped up Ceausescu’s fall, as people were starving and freezing while all the public funding went in this piece of crazy architecture. Nobody really got used to it even now, 25 years after, though tourists made it a must-see place in Bucharest. Anyway, it still requiers a shitload of money just to work properly – heating is as expensive as for one of the biggest neighborhoods in the city. That is a very interesting point; that the construction of this building may have been a catalyst for Ceausescu’s demise. I can certainly imagine what kind of resentment a building like this would have generated and is still felt today. …each time I take a look at it I remember the line from 2012: “It’s Russian!” :D. The building not only displays the love dictators have for the power display but also its ‘russian comunism’ influences. There’s much controversy around it, starting from its ‘not so beautiful’ architecture and ending up to the fact that it is still consuming a lot of resources. The one thing that cannot be denied, however, it’s that it is indeed stunning. It is certainly a monumental feat of architecture and ironically stands to remind people of the opposite of what Ceausescu intended.